The vegetables and pasta cook simultaneously to bring this healthy and beautiful pasta to the table in a hurry. In a large bowl add the pesto and Parmigiano Reggiano and set aside. Scrub potatoes and cut into large bite size chunks. Place in a pot and cover an inch higher than the potatoes with water and add some salt. Bring to a boil and cook for 8 to 10 minutes until tender. Scoop out potatoes with a slotted spoon into the large bowl. Add green beans and bring back to a boil cooking for 3 to 6 minutes until tender. Scoop them into the large bowl. Meanwhile cook pasta according to package directions in well salted water. Reserve ½ cup of pasta water at the end of cooking time. 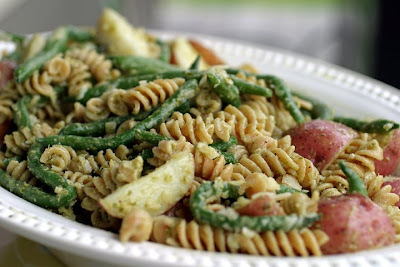 Drain pasta and add to the large bowl with green beans and potatoes. Add the reserved pasta water. Toss to combine and serve immediately. This looks great! I've never thought to combine pasta and potatoes. Yum!